Mattie Kenny has made one change to the side that booked a spot in the league semi-finals. MATTIE KENNY HAS named just one change to the Dublin side that overcame Tipperary as they look to advance to the Division 1 Allianz Hurling league final on Sunday afternoon [throw-in, 1.30pm]. Dublin will face the All-Ireland champions Limerick as part of a semi-final double-header at Nowlan Park, with Galway and Waterford featuring in the other game later in the afternoon. Kenny’s change in personnel sees John Hetherton come into the half-forward line to replace Caolan Conway. Hetherton is named to start after featuring in the second half of Dublin’s one-point win over Tipperary. Oisín O’Rourke, who scored 0-5 for Kenny’s side in that game, takes up his position at full-forward once again. Email “Dublin name one change as Kenny's side look to clinch league final spot”. 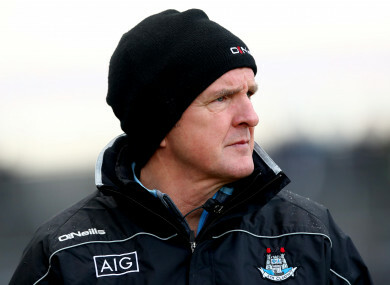 Feedback on “Dublin name one change as Kenny's side look to clinch league final spot”.